Good morning my wonderful friends. This stamp set and beautiful scripted sentiments, banners and a frame. A perfect and complete stamp set to me!! 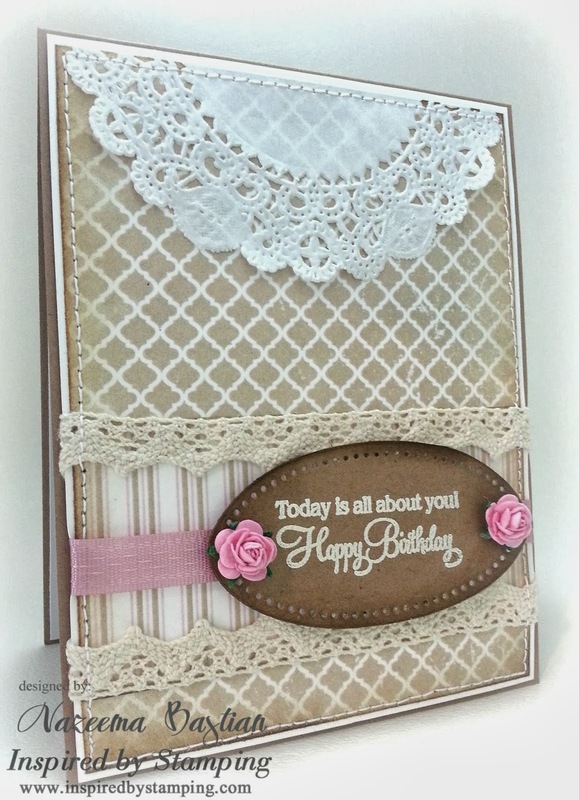 Love the vintage/shabby feel this card has!! I embossed the sentiment in white and it really pops against the kraft cardstock!! Here is today's line up, just in case you happen to get lost. Code: Birthday· All stamp sets will be offered at a 10% discount. All Ribbon and Flowers Marked Down – 25% - 50% off no coupon needed. Contests! !· October 6th ~ 4 sketch challenges from our past IBSI challenge. Love, love, love, love, love! I'm tingling! Wow, Calypso! This is a gorgeous, vintage card! Your interpretation of the sketch is terrific too! Awesome card, Calypso, and your interpretation of the sketch is flawless. LOVE how the sentiment panel actually looks like punched leather! Nice job! Wow, stunning card!! Breathtaking really! !